2009 has gotten off to a bad start for those who follow contemporary music. Within the span of just 10 days, two of America’s leading composers passed away. George Perle died a the age of 93 on January 23rd, and Lukas Foss succumbed to Parkinson’s disease at the age of 86 on February 1st. It’s hard to compare the two composers, other to observe that they were highly regarded masters in their field and influenced many younger composers such as myself. They both had exemplary careers in music, and their life-work stands on its own solidly as a now-permanent record of their dedication and talent. I have no intention to write or re-write their obituaries, but I do have a couple of personal anecdotes regarding the two men. George Perle (born in Bayonne, NJ, May 6, 1915) was a recipient of many honors, including a Pulitzer Prize, a MacArthur Foundation fellowship. He attended DePaul University in Chicago and later went on to study private with Ernst Krenek. After serving in WW II, Perle studied musicology at New York University and his PhD thesis became his first book: “Serial Composition and Atonality.” It would be followed by a more theoretical (but less useful) book on musical set theory titled “Twelve-Tone Tonality.” He was also an expert on the music of Alban Berg, and is two books on that composers' operas are equally insightful. All of his books are required reading for any wannabee composer. 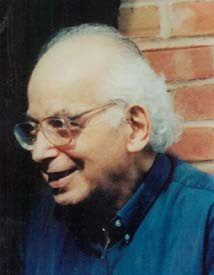 Perle was Professor Emeritus at the City University of New York. He composed a respectable amount of music, and I’ve heard a good amount of it at Tanglewood and elsewhere. His two piano concertos are fine works, almost Mozart-like in their precision and expression. Perle was a craftsman. While I never studied with Perle, he was certainly one of those towering figures that everyone knew about. I remember seeing him at the historic American première of the complete opera Lulu at the Metropolitan Opera where he scripted program notes and was a musicological consultant. When Gunther Schuller miraculously mounted the ISCM “World Music Days” in Boston in 1976 – a week-long conference and love-fest of International Contemporary Music - Perle was selected as one of the composers to represent the US. It was at that festival on October 29th that I first heard Perle's Six Études for Piano (1973-76). The 10 minute work was stunning, and it was superbly performed at New E ngland Conservatory’s Jordon Hall by pianist Morey Ritt. It an impressive performance in many regards. For one thing, the pianist cut her finger on the keyboard, but undeterred, she continued to perform until the completion of the ferocious sixth Étude. I was sitting close enough to see her red blood spew out all over the white keys of the Steinway grand, and it became sort of a horror show to watch as ever more notes on the keyboard became smeared with it. Ritt’s performance of Perle’s set of Études will forever be burned into my mind. For me, that image stands out as a metaphor for the struggle of contemporary music. A few years back, Perle gave an extensive lecture at Brandeis about the recently discovered “secret vocal part” in Alban Berg’s Lyric Suite. It was supported by live examples performed by the Lydian String Quartet and a soprano (whom I don’t remember). His lecture was exciting, and his familiarity with the music, the biographical context, and its analytical interpretation was impressive. Perle had been preoccupied with Berg's string quartet since 1937, and you could sense his excitement. It was Perle who in 1977 discovered annotations for the hidden vocal line, a secret love song to his mistress Hanna Fuchs-Robettin, cryptically notated in a study score given to her by the composer. After the lecture I went up to meet Perle in person. He gladly signed my copy of the new UE Perle-Edition of the Lyric Suite vocal score. I mentioned that I had also listened to his recent CD of orchestral music, and enjoyed his music. He was quite flattered, and very appreciative of the attention. I was glad to have met him. 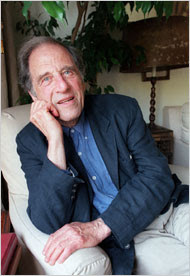 Lukas Foss, a German émigré, fled to Paris when the Nazis came to power in 1933. He enrolled at the Conservatoire and studied piano with Lazare Lévy, flute with Louis Moyse, composition with Noël Gallon and orchestration with Felix Wolfes. His career in American came to the fore in 1953 when he succeeded Arnold Schoenberg as the head of the composition department at the University of California at Los Angeles. As someone who wrote all kinds of music, from electronic to minimalist, he drew much attention (and some criticism). Although Foss commuted to Boston from NY to teach at Boston University in recent years, I never met him around town. But I do remember him from my stint in NY in the early 1970s at at time when he took over the Brooklyn Philharmonia and turned it into a “real” orchestra. There was a panel discussion at Juilliard one evening, and it included a “Who’s Who” of American composition, including: Aaron Copland, Peter Mennin, Roy Harris, and of course Lukas Foss. Foss was clearly the hyper-active child on the panel, and spoke with great energy and excitement about the state of the music world as it existed at that time. He mentioned that his father was a philosopher, and it was clear to me that he inherited some of those genes. Aaron Copland, was very quiet, and would occasionally look over at Foss in disbelief at some of his statements. For example Foss declared that the future of music would be transformed by the introduction of wind instrument mutiphonics. He proclaimed that all composers would be writing pieces that utilize these new “chords.” Copland winced. Foss then spoke about his colleague Copland saying, “nobody can make a C major chord sound the way that Aaron does.” Of course he was right, but I don’t think that Copland took it as a complement, since he was known to have a streak of paranoia and a degree of insecurity about the substantive value of his increasingly populist music. (Once by chance, I had the good fortune to ride into Manhattan on the NY Central train line with Aaron Copland. He enjoyed talking shop with young composers). I don’t remember if Foss’ wife Cornelia was present at the Juilliard lecture or not. Just two years ago she revealed that she left Lukas in 1967 for Canadian pianist Glenn Gould, taking her two children with her to Toronto. Their affair lasted until 1972, when she ultimately returned to Lukas right around the time of the Juilliard lecture. But she stayed with him up until is death and had stated to the press for the obituary that her husband had been working until about a year and a half ago, until his Parkinson's made it too difficult to compose.